For each issue of Literary Mama, Literary Reflections shares a writing prompt, inviting our readers to respond. Our editors provide feedback on the responses we receive, and we post our favorites on the blog. This month’s writing prompt is inspired by Maryann Lawrence's essay, "Manifesto Destiny: The Crafting of a Family Manifesto." Maryann Lawrence describes how she wrote a family manifesto after two cross-country moves in the course of a year left her family feeling they had somehow lost their moorings. "Our family needed direction, a path," she writes. "We needed to reconfigure our lives and redefine our purpose. The old ways just weren't working. We needed a manifesto." We show support and understanding with respectful behavior in our words and deeds—to speak highly of one another in the company of others and to help one another with selflessness. For, to raise those around us (even above ourselves) reflects upon our own character and brings the Family closer to the attainment of its goals and achievement of its vision. Lawrence writes that their family manifesto was a constant through years when her children were young and when her marriage suffered the stresses of job loss, foreclosure, bankruptcy, and teenagers. She revised it about every seven years to keep it relevant, noting that children and parents grow and change, even if the family's mission and vision do not. Is there something or someone that has served your family as a guiding force through difficult circumstances or times of change? Perhaps a family contract, a set of shared values, or even a person whose presence ensured things didn't fall apart? Tell us about a time when that guidance was especially important. Read Lawrence's essay and submit a 500-word response to this writing prompt by July 7, 2017, for feedback from our editors. 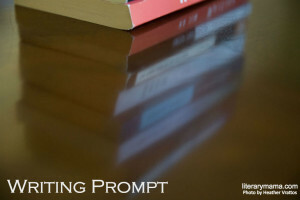 Email it to LMreflections (at) literarymama (dot) com and note "June Prompt" in your subject line. Please do not attach the essay, but paste the response in the body of the email.